Note to any potential band members who are considering sending a promo to Fireworks or Rocktopia for review; please include a biography to give us some background of your band! Capisce? Listening intently to the music with no press release to accompany the album, only Google could save me, and with the results for "Reportage" listing the working title of an unfinished album by Duran Duran (no) and a boy-band from 2008 (definitely not! ), I was left with one result written in Russian; bearing in mind the music I'm hearing has a singer with a strong European accent I enter the website and see a picture of a group of guys, long hair, tattoos, a couple of Iron Maiden T-shirts, Bingo! Unfortunately a translation isn't possible so all I can reveal is that REportage (yes, two capital letters) are a seven-piece band who've supported W.A.S.P., Maiden, Udo and Deep Purple amongst others, and 'Prison Of Ice' is their debut album. Nine tracks and just under fourty minutes is acceptable these days, but it's a pretty mixed bag of styles. Opener 'Do Lives Coincide' is a very melodic anthem featuring some distinctly Maiden-like guitar melodies, 'Ride The Stream' veers off in an uptempo Power Metal direction, then 'Hiding Inside' goes all NWOBHM. 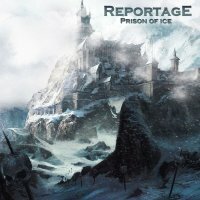 'I Was in Your Eyes' is the obligatory power ballad, albeit with a slightly Progressive arrangement, 'Don't Run Away' returns to the NWOBHM style, then 'Prison Of Ice' and 'Even If You Don't Love Me' resurrect the melodic sound of the opener, while 'Don't Forget About The Past' delivers a more contemporary Metal sound. Closing the album is a cover of 'Freaky Dreams' from the band Enter The Text; no, me neither. It's not bad, but not exactly great either due to the blend of styles, however I have to admit the guitarist weighs in with some quite brilliant solos – I only wish I could tell you his name! My advice to REportage would be to choose one musical direction and stick to it to make your albums more cohesive and your music more approachable – and include a biography!